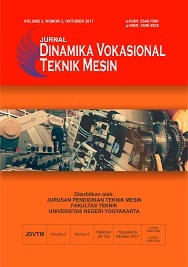 Jurnal Dinamika Vokasional Teknik Mesin (JDVTM) is published by the Department of Mechanical Engineering Education, Faculty of Engineering, Universitas Negeri Yogyakarta. The journal is published twice a year in April and October. Each publication contains articles comprising high quality theoretical and empirical original research papers, review papers, and literature reviews in technical and vocational education and training (TVET) on mechanical engineering. Submitted papers must be follow the JDVTM Template, for an initial screening by editors and further review process by at least two anonymous reviewers. The Guidelines for Authors are available here.